Pets provide companionship and unconditional love. Pets however require attention and care. Pets are totally dependent on their owners for their well-being. They need to be cleaned and cleaned up after. They need medical attention from qualified veterinarians. Like all living creatures, pets eventually die. They can't survive without basic needs such as food, water, oxygen, and shelter. They have fragile bodies that can suffer from illness and injuries. Pets need to receive immediate medical assistance if there are signs of abnormal behavior. They are unable to communicate by talking and therefore it is up to their owners to notice if their pets are in distress. Even with medical care, sometimes, as with humans, they can't be saved from the clutches of death. As an integral part of the family, there are many emotions that appear upon their death. There may be feelings of denial, confusion, guilt, anger, despair, grief, relief, and acceptance. Two years ago, close friends decided to raise 2 guinea pigs and named them Nana and Bobo. A week ago, Nana passed away on the operating table. I received notification through a text message simply stating "Nana died." Nana died at a young age and should have lived much longer. The final two weeks of her life were difficult and painful. I will remember her curiosity and appetite. 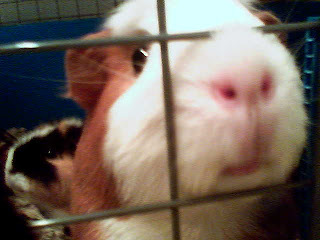 She was a demanding piggy that squealed for veggies upon hearing the sound of a fridge door opening or a plastic bag rustling. I enjoyed watching her roam around her cage and munch on her food. She leaves behind her companion Bobo as well as her loving family. She will be missed. She is my pet. I really like her. She is outgoing and friendly to family and friends. She really like to eat vegetables. I picked up the poos every day to make sure her cage was clean. I treat her like a part of my family. It was too soon to say goodbye to Nana. I will miss her.